Almost 50% of the revenues of S&P 500 companies are now from outside US. As such their stock performance is strongly coupled to their performance in international markets and implicitly the economic trends of these countries. Question: Is investing in S&P 500 sufficient to get international exposure? The international exposure afforded by S&P 500 constituent companies might not be sufficient. The graph below represents the relative size of stock markets (capitalization) across the world. 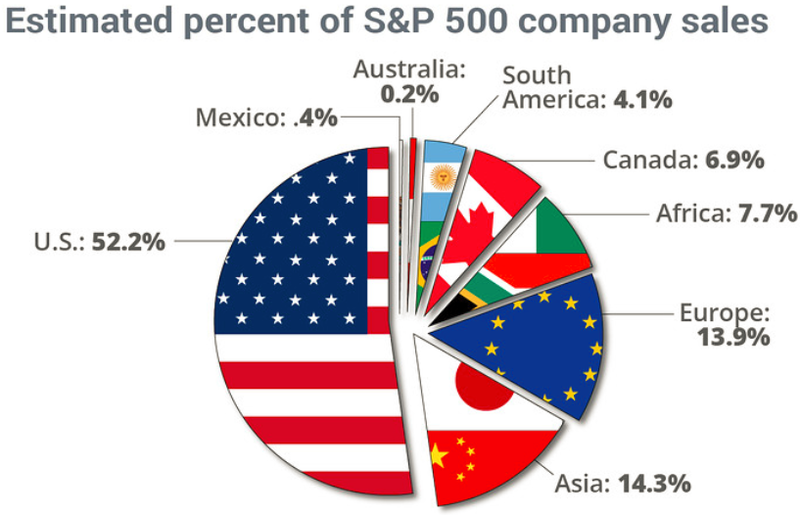 USA has about 53% of the world stock market capitalization. Obviously, by investing only in the US stock market we are leaving about 47% of stock market. One of the primary reasons to invest in international stocks is to diversify. Diversification does not always mean best returns. It’s about reducing risk and accepting a reasonable return. One of the classic techniques to diversify is to invest in bonds. This does not necessarily increase your long-term returns. It however reduces your risk and acts as a safety net. Investing in international stocks insulates you from potential down turns in the US stock market. It is possible to invest in international stocks and bonds. This post will deal primarily with investing in international stocks. I might write another article in the future for international bonds. International stocks come in two broad categories. Equities of any country fall into one of these two categories, Developed market funds and emerging market funds. The emerging market funds typically invest in emerging economies like Brazil, Russia, India, Taiwan, China, and South Africa. Emerging markets tend to be a lot more risky (geopolitical, poor corporate governance, lack of liquidity, socioeconomic etc.) and could potentially provide better rewards. They have a lower correlation (0.82) level with the broad US market and as such could contribute to diversification. 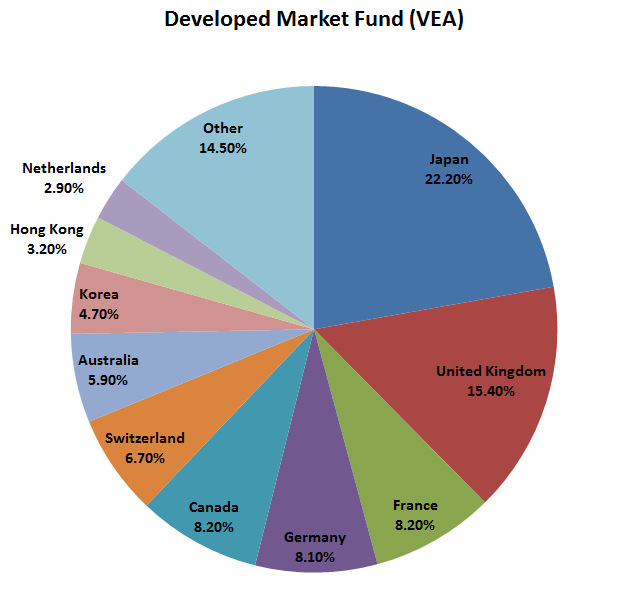 The developed market funds typically invest in developed economies like Japan, United Kingdom, Canada, France, Germany, Switzerland, and Australia. Developing markets tend to be a lot less risky as compared to emerging markets. They have a higher correlation level (0.86) with the broad US market and as such could contribute to diversification albeit to a lesser extent. You could still slice and dice into further categories. For e.g. Vanguard has separate funds targeting Pacific and Europe. iShares has an ETF for almost every country. These ETFs are useful if you want to get exposure to a particular country (e.g. iShares MSCI Canada ETF). 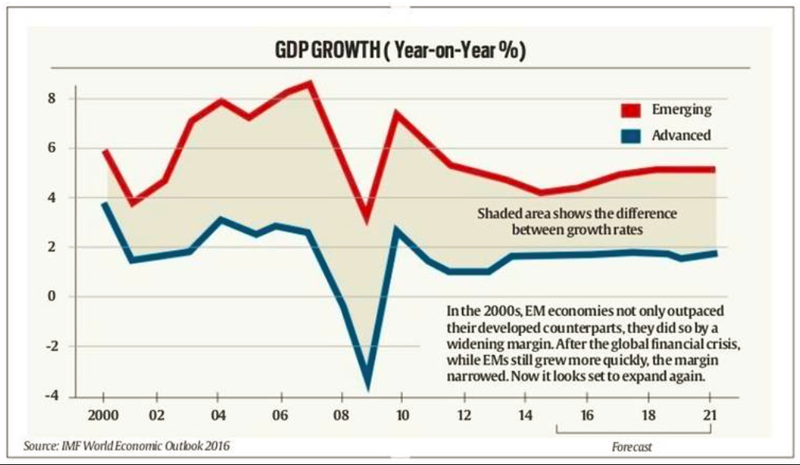 Emerging markets represent some of the fastest growing economies in the world. Investing in fast growing economies could potentially provide better returns. On an average the US stock market has provided better returns than international stocks. 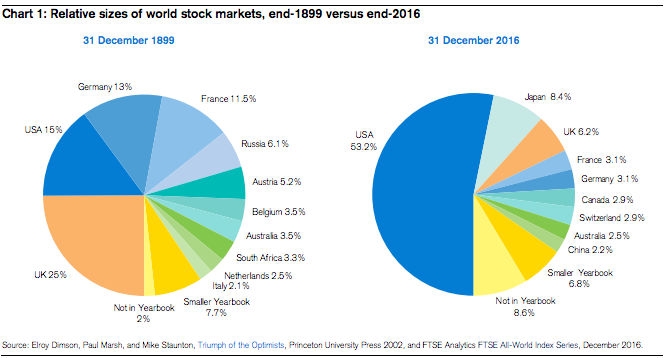 However, in any given year (in the past 30 years) the best performing stock market has been outside the US. By purchasing international funds there is an additional level of diversification i.e. currency diversification. This could potentially cut both ways. In the periods when US dollar is stronger than other currencies (let’s say Euro) you get more Euros per US dollar. Which implies you would be getting more international stocks for each US dollar you spend. If US dollar weakens after that, your Euro dividends are going to fetch you much more US dollars. A good idea might be to buy international funds when US dollar is strong and to sell when it’s weak. Currency hedging is a strategy used to reduce the effects of currency volatility. However, it is very difficult to time currency fluctuations. In the long run adding currency diversification reduces risk. International stocks are also attractive to dividend investors. International funds tend to pay high dividends. However, the dividend payout might not be as consistent as the US stocks. 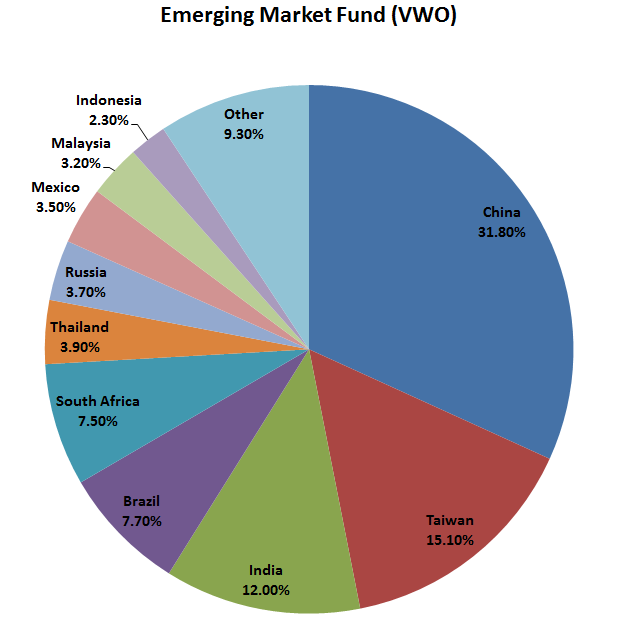 Emerging Market fund has a yield of 2.41%. Similarly, the developed market fund has a yield of 2.77%. In comparison the Total US stock market has a yield of 1.75% (S&P 500 has a yield of 1.87%). Just like US dividend achievers there are also international dividend achievers (more on that later). Internal Revenue Service (IRS) offers either a foreign tax credit or an itemized deduction for taxes accrued in a foreign country on a foreign source of income that are subject to U.S. tax on the same income, such as stock dividends. Historically, international stocks have out-performed US stocks over long duration of time. Being a passive investor, I work with the assumption that I can never time the market. As such adding some international funds into my portfolio might give me a much higher ROI. All broad US stock market indices are at all-time high. Finding value is becoming increasingly difficult. Whereas the international stock valuations are much lower (Emerging markets have a P/E of 14.8 and Developed markets have a P/E of 16.0). This might indicate higher growth in the future. This provides us an opportunity to pick up cheap value stocks. 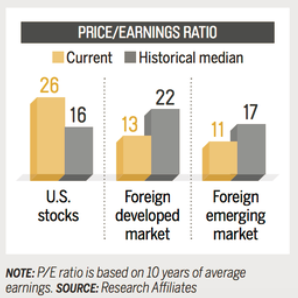 In comparison, US Stock market has a P/E of 22.7. Investing in international funds tends to be more expensive than US funds. Lipper average expense ratio of developed market funds is 1.336% and that of emerging market funds is 1.502%. For obvious reasons emerging market funds are more expensive than developed market funds. The Lipper average expense ratio for Total US market funds is 1.12%. In conclusion, I believe that international stocks have a place in our portfolio. They help in diversification of our portfolio. Recommended allocation is between 30-50% of the portfolio. 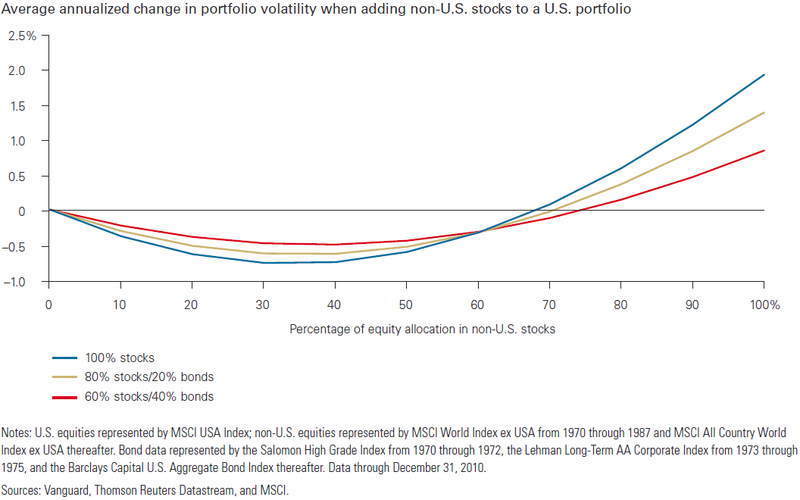 According to Vanguard, on an average, dedicating 30% of equities to non-U.S. stocks have provided most of the maximum possible diversification benefit. My portfolio consists of 30.63% international funds (24.56% in developed markets and 6.07% in emerging markets). 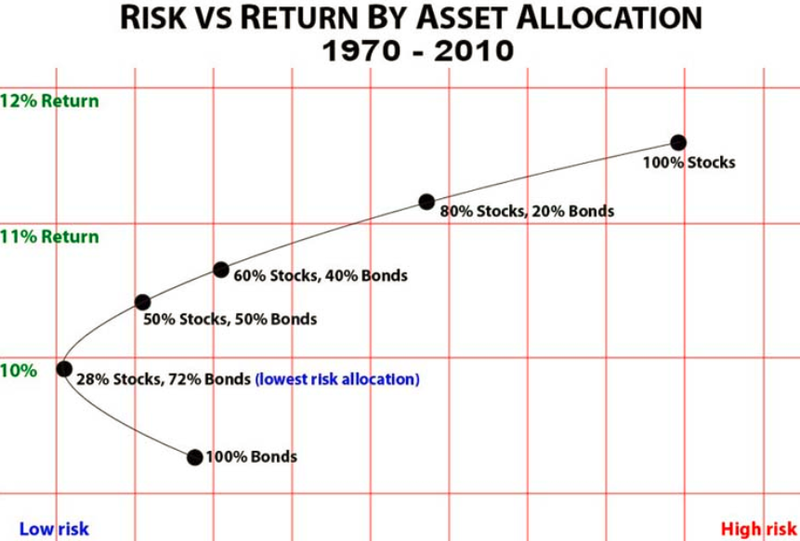 Your final allocation might be determined by your risk appetite. Additionally, you might also consider S&P 500 as affording sufficient international exposure and completely ignore international funds. Part (2) of this article will focus on different international funds offered by Vanguard. Awesome!. 25% is a good number. That's a good write up Geek. I do agree that one of the main benefits to investing in international stocks is for diversification. My current portfolio is made of of large U.S. stocks that have international portfolio. However, in my 401k, 20% of my portfolio is invested in an international fund. Rarely is it a good idea to put all your eggs in one basket. Nice diversification DP. Do you have exposure to emerging markets? I'm honestly not sure Geek. I never thought international exposure was great. a point to ponder. Nice article. I have 20% of my assets in international stocks and while that has under performed in recent years, I think the valuations there are solid right now and there's some good opportunities out there. Agreed.In 2017 they have been on fire. My idea is to keep dollar cost averaging into international stocks. I've held a small amount in international Vanguard funds in the past, but I'm definitely more bias towards the Australian market - we effectively have a tax free account that many of our shares are in, and I just love those bonus franking credits on the Australian dividends! Makes absolute sense. International funds are a nice addition to an already diversified portfolio. ASX dividends are awesome. Yes, great point. Most of the top US stocks are actually truly global stocks. Plus, they have been and should be great investments. I thoroughly enjoyed this article - simple to understand too.